After quite some time thinking about buying into the Hasselblad system I finally settled for a basic 500 EL/M system, they were the real studio work horses so you have to be careful that everything is still working and in good order. The complete system that I've bought seems to be collected together from different sources. The back insert has a different number than the back itself, which is not a big technical issue but it shows it's not the original combination, all the body caps were there but more than one body needs and the lens itself was built after 1978, which is the year the body was built. The camera is in perfect working order however and it's great on a tripod. I wouldn't want to carry it around for a long time though as it's quite heavy with it's 2.5 kilos. Something I was not fully aware of when I bought my EL/M is that this camera is the highly collectable "10 years on the Moon" anniversary model which has been produced from 1979 to 1980. Of course I knew it to be a special version but since only 1500 of them were built, it's very special indeed. My camera has the number 0549 and came in its original box with the original booklet. 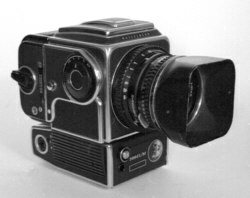 The camera itself is very much the same as the standard EL/M but has a different front on the motor part und the lens. It includes a stylished picture of the moon and has the special edition number engraved. Original price in 1979 was 4500 Deutsche Mark. But even though this item is highly collectable, it was bought by me to be used, not to spend its life as a show piece in a glass box. 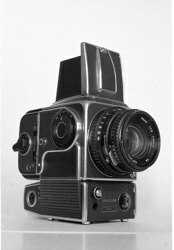 For a concise history on the Hasselblad system, how to date equipment and other useful information, check out my page on The Hasselblad System. Secundary shutter in body only to protect the film from stray light. Power : 2 hard to find NiCad rechargable batteries. Note that most original batteries are past end of their live. Make sure you'll get new ones from Hasselblad or use one of the occasionally offered, self-made battery packs. Stay away from the 9 volt kits, the voltage is too high and Hasselblad actually sent out a warning not to use them as they might shorten life of the engine. 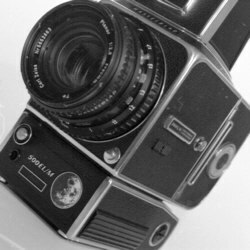 The other Hasselblad in my collection. Read and Download an online copy of the Third edition (July 1969) of this Focal Press guide.